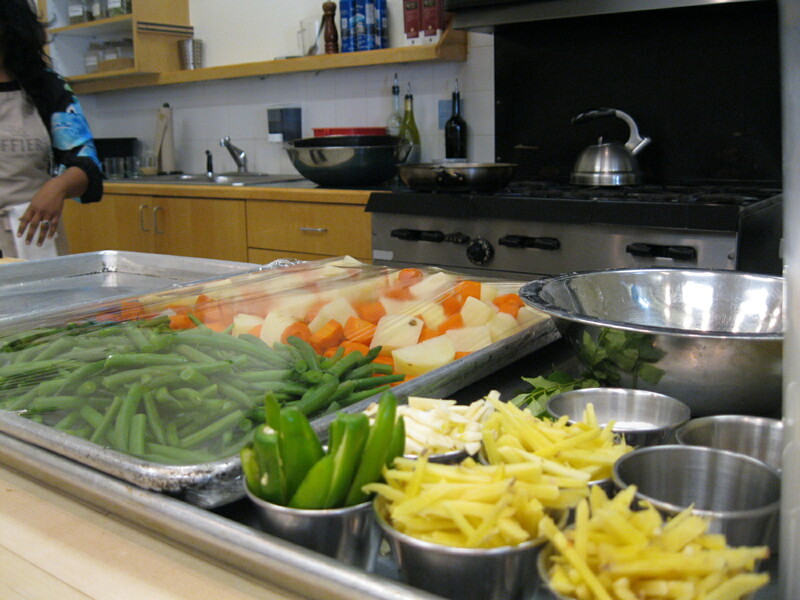 Auguste Escoffier Culinary school really cooks! 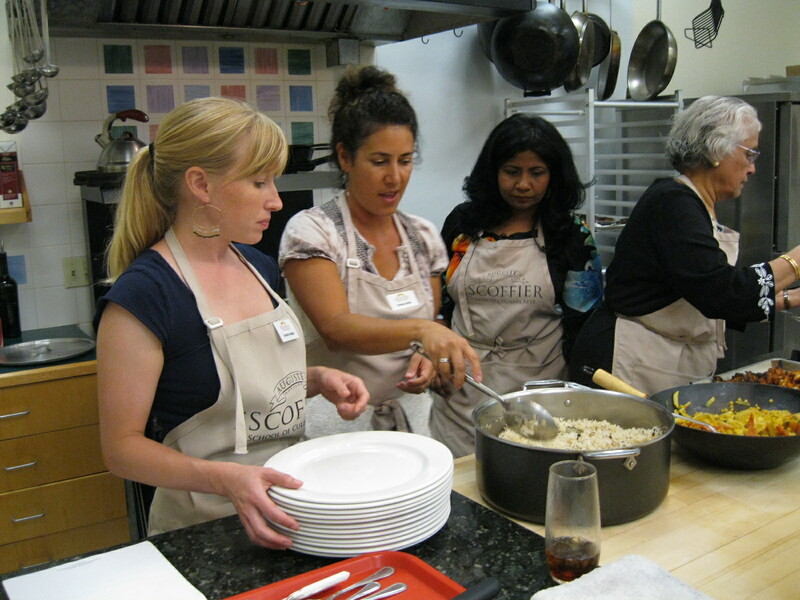 Recently, I attended a two-day home cooking seminar, Culinary India, complements of Auguste Escoffier’s Culinary School of the Arts, to learn about Indian cuisine. Part one of this three-part story was about Indian traditions and cooking tips, as well as a glimpse of the celebrity Indian foodies who taught the seminar. Here, in part two, I will share a quick bit about the school and its home cooking classes; and, in the last segment, I will post the best of the recipes we learned. Walking through Escoffier’s double doors, you encounter a trampoline-sized butcher-block table surrounded by stools. The walls on three sides of the cooking theater are stocked with utensils, plates and other tools of the trade, but the crown jewel is the massive iron grill flanked by a giant gas cooktop and cavernous convection oven. Enough hospitality horsepower to feed an aircraft carrier…or a hungry crowd of Indian chefs and foodies. My house doesn’t look anything like this, but I can’t wait to see what we will learn about home cooking in India. 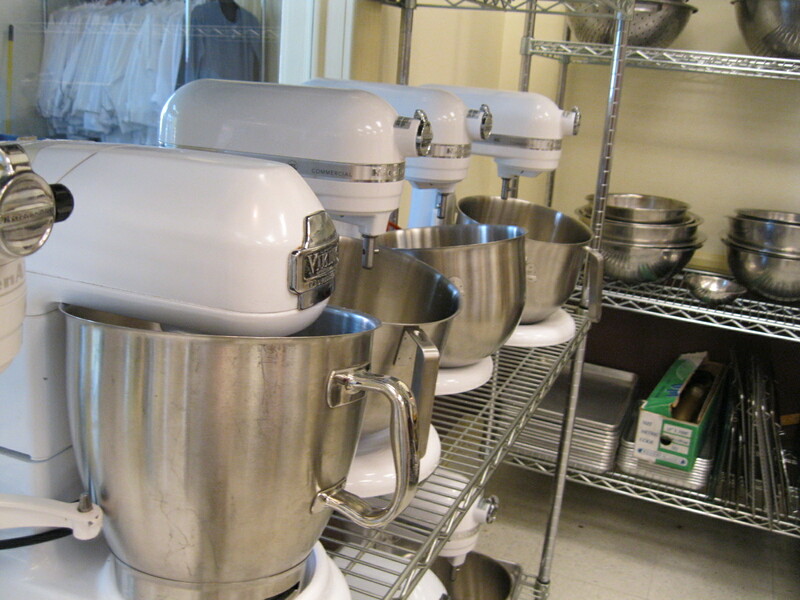 The home cooking courses are scheduled and paced for convenience and fun, often at night or on weekends, and are generally divided into technique classes, allowing the home chef to feel more confident in both creating recipes and riffing on existing ones; and workshop classes with a whimsical focus—cheese making, say—permitting amateur cooks to follow their passion. 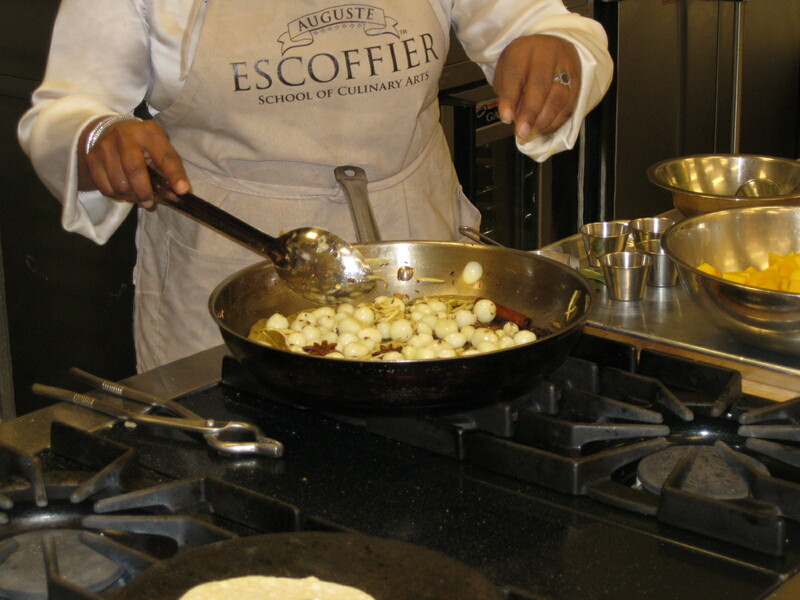 Now for those cats serious about either a food career or simply pursuing a passion in a comprehensive and rigorous manner, Escoffier has a full curriculum of classes taught in the classic style…from soup to nuts, one might say. Local focus: they buy a majority of their spices from Savory Spice (a Colorado-based company) and meats and vegetables from local farms when possible. 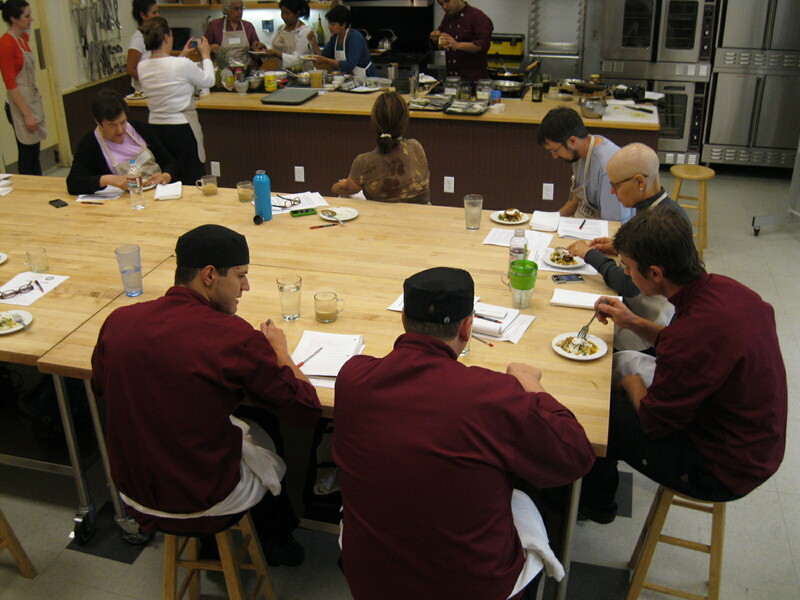 In fact, full time students spend two full weeks at local farms, learning Farm to Table practices, sustainable techniques and methods of artisanal food (rather than mass market) production. Personal attention: The students that I met were absorbing information as rapidly as a French Dip sandwich takes on Au Jus, and several attributed that to the great, talented staff. Ken Hause is brimming with excitement about the Farm to Table program; Ellie Scott, the Home Cooking Kitchen Manager is organized, thorough and 100% focused on making sure that each student feels welcome and ready to learn. And if the guest cooking instructors, such as famed chef Suvir Saran, is any indication of the teaching talent, it’s no mystery why the learning curve is so easy. Fun: The number of smiles per capita is as plentiful as folds in a NY deli roast beef sandwich. No doubt part of that is because the students are often following a dream, rather than staggering through some accounting or statistics curriculum, but there’s more: call it an aura of play, maybe, but something silly is in the air. Even the Registrar, Pat Hagan, is intent on enjoying the students and having a good time—after all, it’s cooking school, not eye poking school—as she scoops up a steaming forkful of barbecued cauliflower. And as it turns out, there are several full-time students at the Culinary India home cooking seminar, listening, learning and just hanging out. 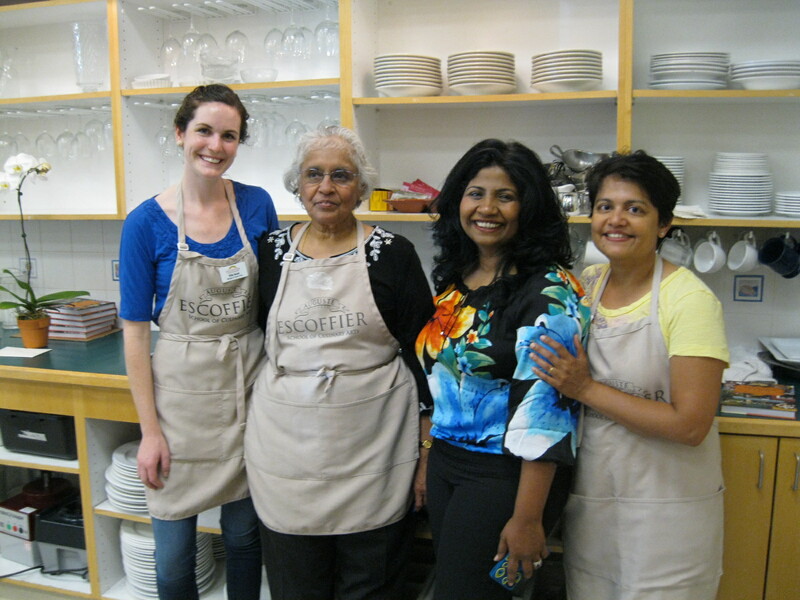 But back to the Culinary India class…. We—students, amateur cooks, bloggers and vacationers— grab seats and settle in for the show. The cooking area is a natural lectern, and is equipped with a full width mirror showing grill, burners and chopping block clearly. I suppose there must be some comparatively dry classes at Escoffier—bakery math or inventory control, maybe—but for pure pleasure classes like Culinary India, it is nothing but great stories, exotic smells, brilliant colors and murmurs of delight. The weekend was definitely fun, enlightening and inspiring. I think everyone left with an urge to cook Indian food (it’s way easier than I expected) and to impress friends and family with their new recipes. The only flaw I found was a lack of hands-on experience for the students. This was a demonstration class, but I love to sink my paws elbow deep into flour, man the grill, or simply chop veggies. The majority of home cooking classes allow you to be as hands-on as you like, but check the syllabus or speak to Ellie Scott to make sure. In the final installment of this series, “coming soon,” I will publish some of the best recipes we learned. Until then, please pass the chutney!